Heart-based tangles are always popular and it never ceases to amaze me to see how many different ways they can develop as part of a pattern or tangle. Belgian CZT Ria Matheussen is back today with her sweet Hidden Hearts tangle. Ria recently shared her fun Tupi and Tupuk tangles with us. Named Hidden Hearts “because the hearts are a bit hidden into the tangle. I know there are already a lot of “heart tangles” and I never thought I could find another one but, pure by coincidence, Hidden Hearts appeared on my paper while drawing and I’m happy to show this new pattern. Hidden Hearts offers many variations. It can be used as a monotangle, as a background or in combination with other tangles”. From time to time I have problems creating strokes in certain directions as my balky thumb interferes. When I see that’s what’s going on, I turn my tile and do the tangle “upside down”, and the strokes seem to flow more readily. Hidden Hearts looks great any way you turn it. Ria illustrates the step-by-step instructions for drawing Hidden Hearts below and shares some pretty variations for her tangle including those in a lovely ZIA. This is a delightful tangle and the way you put together in your completed is lovely. It is really great! Thank you very much for your kind comment. 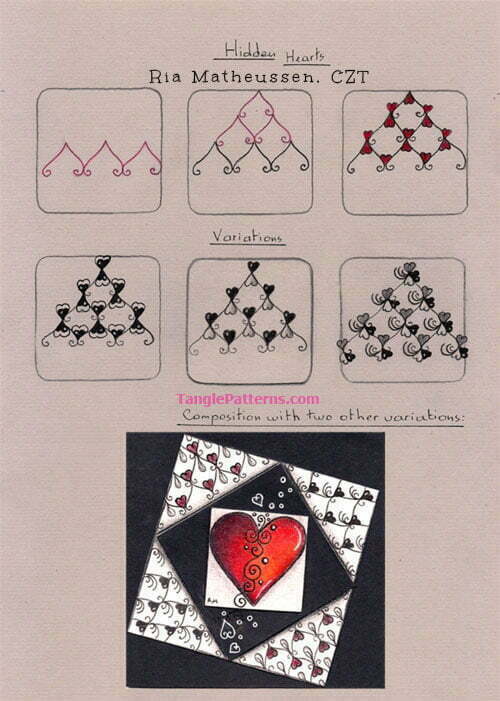 Hidden Hearts is an easy tangle but gives many opportunities to variate. I wish you succes. Thank you very much Jan for this nice compliment. I’m glad “to meet” you again by this way and wish you a wonderful spring, happiness in your tanglework and your personal life and send you warm regards from Belgium. Alway love more heart tangles. Thanks for a lovely new one. Thank you Leslie for your kind words. I’m glad you like this one and wish you fun while using. Happy Easter! Ria, that’s a really cute tangle. Thank you for sharing it with us. And Linda, thank you for posting it. Thank you Joyce for your kind comment. I’m glad you like HH. It is a funny one to draw and uncomplicated, and yes I’m grateful that Linda did make such a nice presentation. Wish you the best! Als trouwe fan van jouw werk vind ik dit weer een prachtige nieuwe tangle. Proficiat. Dank je wel Luc. Je weet dat ik je commentaar heel erg apprecieer. Vrolijk Pasen en hartelijke groeten vanuit Izier! Oh, dank je wel Karin voor je comment. Je kan veel variaties maken op dit patroontje en misschien is het een ideetje voor volgende Valentijn. Eindelijk is de lente aangekomen, ik wens je veel vreugde en mooie Zentanglemomenten in dit nieuwe seizoen en vanzelfsprekend hartelijke groeten terug! Google translate: Oh, thank you Karin for your comment. You can make many variations on this pattern and maybe it is an idea for next Valentine. Finally the spring has arrived, I wish you much joy and beautiful Zentangle moments in this new season and of course warm regards! Pretty tangle, and I think, a very handy one! Thank you Karen for your kind words, I hope you will enjoy this tangle!